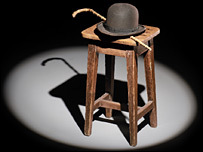 An iconic hat and cane used by Charlie Chaplin have been sold for almost $140,000 (£77,000), a record price for a piece of the actor's memorabilia. The trademark bowler was stamped with details of the Hungarian manufacturer and had a Chaplin Studios label. 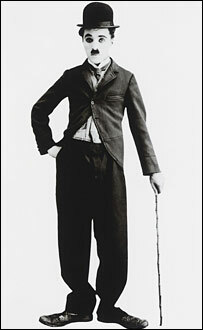 The bamboo cane measured 32.5 inches (82 cm) and Chaplin appeared with both in the 1940 film The Great Dictator. The auctioneers also sold a John Lennon-inscribed diary and a two-headed llama made to promote Doctor Dolittle. The diary was for 1979, the year before the Beatles star was murdered, and fetched $9,560 (£5,250). It contained the message: "To Michael, with love. John, Yoko, Sean. Xmas 78." The llama was made by 20th Century Fox as a replica of a character in the 1967 Doctor Dolittle film. It was displayed in American and European cinemas and was sold for $4,780 (£2,600) by a man who had been working for the studio in Sweden at the end of the 1960s. He was allowed to keep it after Doctor Dolittle's final European premiere in Stockholm because it was deemed too big to return to the company's US offices. The auction of movie and rock 'n' roll merchandise also saw the sale of the saxophone played by Bill Clinton at the ball to mark his inauguration as American president in 1993. It fetched almost $7,800 (£4,230) at Bonhams and Butterfields in Los Angeles.